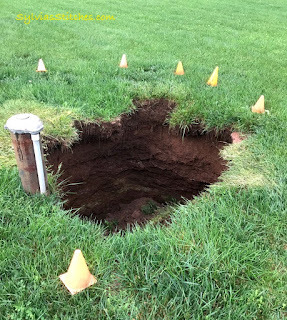 Sinkhole in our back yard. Can you believe this? It is really deep, and cavernous. Measures 8' to 10' deep. About 4' across when this photo was taken. There is no earth under that grass that is around the opening. 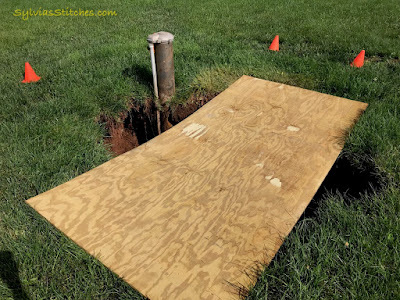 I put a sheet of plywood across the opening, and marked off the area with the kids' soccer cones. Just to try and keep any wildlife or people away from this area. I wasn't sure who to call at first, so I started with the well drilling-folks. Unfortunately, we had major well problems two years ago. The well-folks told me to call the county, and they would follow whatever the county recommends. I called the county, and as soon as you mention that a well is involved, they get the health department involved. County health department came out right away. So did the county's geologist. They did their assessment and recommendations. 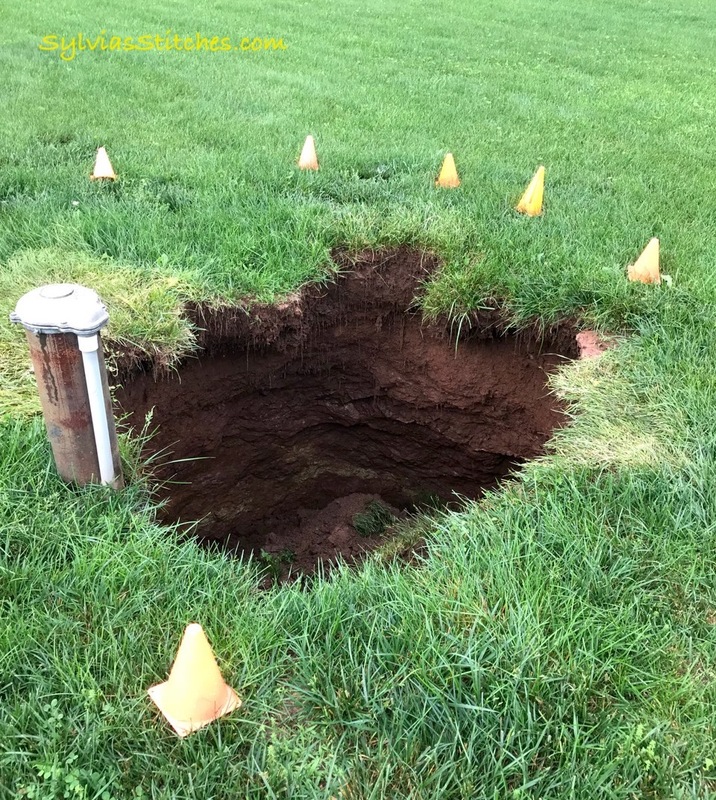 They consider this to be an active sinkhole, the collapse significant and it needs immediate remediation. Our well pipes are exposed. Our well pipe and water lines are also exposed. I had our water tested this week, and it has tested clean with no contaminates. Yay for some good news! 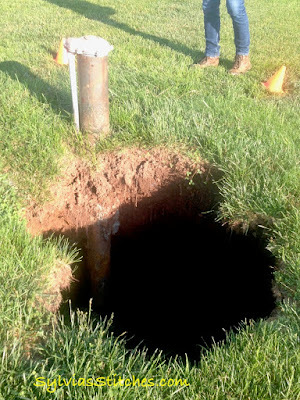 The plan to fix this hole is to excavate it out to find the throat at the bottom and then fill it with a graded filter. I have a feeling this is going to get worse before it gets any better. We just has another rain yesterday, and the hole is now bigger as the top turf has fallen into the hole. 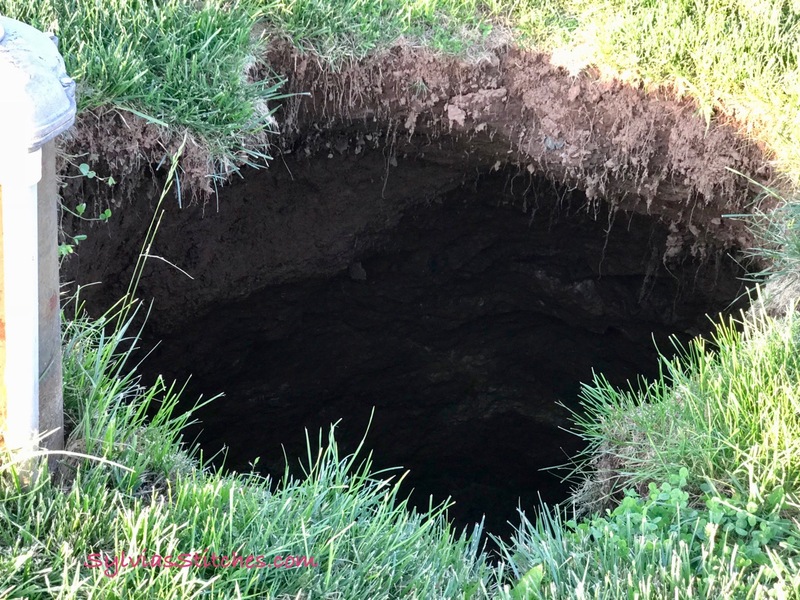 The hole is opening up. The plywood is no longer big enough to cover the entire opening. 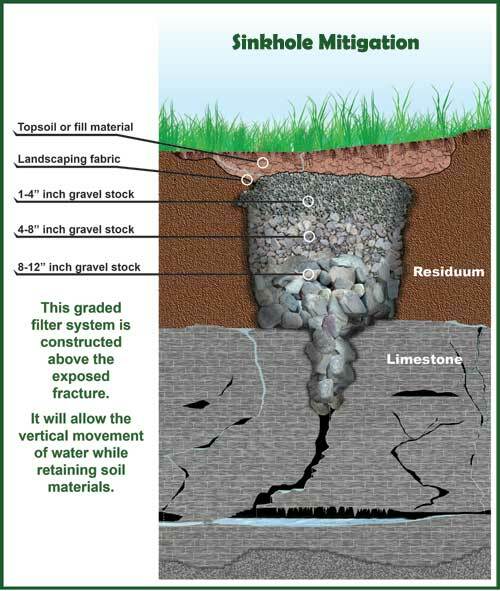 As you can see just over night, more earth has given way from the sides and around our well. I'm now working with a local excavator that is familiar with the limestone soil in our region. The ground is so saturated at the moment, there is a concern that bringing heavy equipment here will cause further collapse. So we will wait until things dry out a bit. We're in for more rain storms this weekend. Hope they pass quickly and without more damage. Here is the flooding that happened nearby last week when our rains came through. We don't live far from White's Ferry. 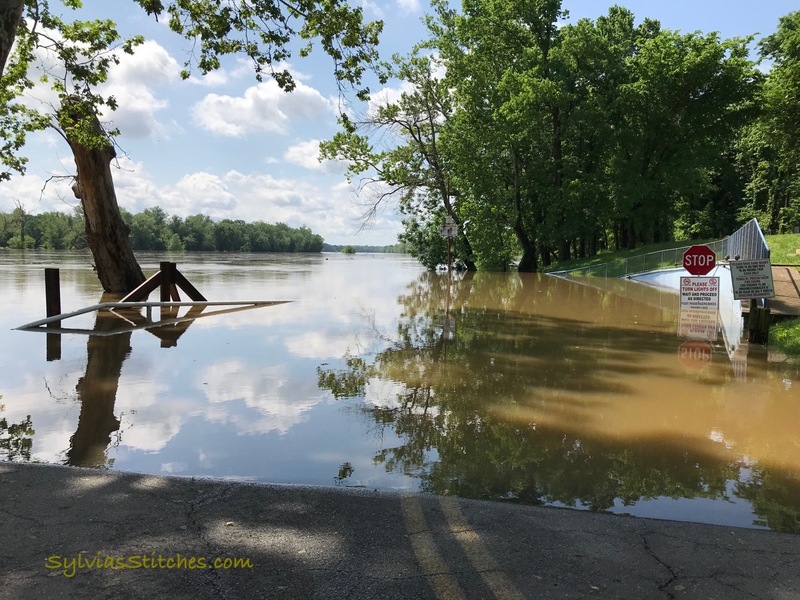 Flooding on the Virginia-side of White's Ferry.